This is a very short, professionally drawn agreement to enable a guarantor to impose a legal obligation on the person he has guaranteed. It can be used between private individuals or companies. This indemnity agreement does not protect the guarantor form his guarantee in any way. It simply gives him a hard, legal basis for suing the person or company he has guaranteed if his guarantee is called by the party protected by the guarantee. It can be used in any circumstances of a guarantee, but will be most useful in a company situation, where a director has guaranteed a debt or obligation of his company. If the company were to collapse and the guarantee called, the director could at least use this agreement to claim against the company as an unsecured creditor. Company director A enters into hire purchase agreement by his company to buy Porsche car for himself. 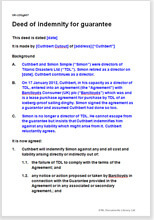 Director B signs the personal guarantee but does not realise that A has intentionally no also signed it. B discovers the position and insists that A signs to an indemnity agreement so that it is he makes good to B if the finance company should call on the guarantee. Company group in reconstruction: subsidiary XYZ is to be sold. Buyer concerned at level of debt in XYZ. Seller agrees to indemnify buyer if XYZ fails to be able to meet its obligations due in next 12 months. Note that this is a more efficient way to deal with the circumstances than for the seller to agree to guarantee the debts because, first, the dubious solvency of XYZ will remain unknown to a creditor and second, because if the indemnity is called, the cash will go to the buyer and not to XYZ. There is no modern statute law relating to indemnities. This document is based on contract common law. Net Lawman offers other related document templates related to new guarantees at Guarantees and Indemnities.